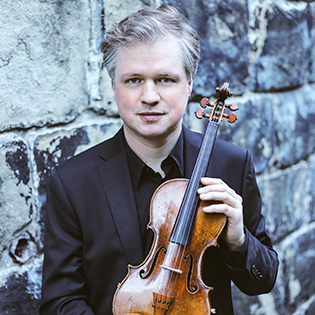 Norwegian violinist Henning Kraggerud is Artistic Director of the Arctic Philharmonic Chamber Orchestra. His extraordinary reach as an artist is a result of his versatility and passion for music, as well as the genuine quality to his playing and the beauty of his performances. His teaching and educational writings provide fascinating insights into his multi-faceted approach to music-making, while his composing, arranging and improvising – frequently bringing his own works into the concert hall – recall the spirit of the old masters such as Josef Suk and Eugène Ysaÿe. In the 18/19 season, Henning is Artist in Residence with the Kristiansand Symphony Orchestra in Norway and the Poznan Philharmonic Orchestra in Poland. His eminence as a soloist and play/director have led to invitations time and again to many of the world’s most significant orchestras, most recently the Toronto Symphony, Baltimore Symphony, Danish National Symphony, Tonkünstler Vienna, BBC Scottish Symphony, Tasmanian Symphony and Macao orchestras. Highlights of the current season include debuts with the Deutsche Kammerakademie Neuss am Rhein, Orchestra della Toscana, Royal Danish Opera orchestra and Kuopio Symphony. Henning also returns to Helsingborg Symphony and Vancouver Symphony orchestras and appears with Camerata Salzburg and Janine Jansen at the Salzburg Mozartwoche and on tour in Germany. Henning is a prolific composer whose works are performed by many prominent musicians and orchestras around the globe. His largest-scale work to date is entitled Equinox: 24 Postludes in All Keys for Violin and String Orchestra. Commissioned, premiered and recorded by the Arctic Philharmonic Chamber Orchestra with Henning as soloist, the work was composed as a musical counterpart to a story specially written by world-famous author Jostein Gaarder, and has been hailed as “a fascinating composition to return to over and over again” (MusicWeb International). In 2017, Henning composed a violin/piano version of Equinox, which was premiered in Norway in 2018 with pianist Clare Hammond and Jostein Gaarder narrating. Henning’s output as a composer also includes Preghiera, commissioned and performed by the Brodsky Quartet in 2012, and The Last Leaf, given its first performance in 2014 by the Britten Sinfonia, as well as cadenzas for two of Haydn’s cello concertos commissioned by Clemens Hagen in 2015 and Victimae Paschali for choir and orchestra commissioned by the Trondheim Chamber Music Festival. In 2017, the Ostrobothnian Chamber Orchestra commissioned and performed Topelius Variations for string orchestra, which Henning performed again later that year in an extensive national tour with the Australian Chamber Orchestra. With his ever-present spirit of discovery, Henning gave the 21st century premiere of the Johan Halvorsen Violin Concerto with the Norwegian Chamber Orchestra at the 2016 Risør Chamber Music Festival. Originally premiered in 1909, the concerto was subsequently considered lost until its re-discovery over 100 years later. Henning went on to play the work with the Oslo and Bergen Philharmonic orchestras, and in 2017 released a recording on the Naxos label with the Malmö Symphony Orchestra and Bjarte Engeset, leading BBC Radio 3’s Record Review to comment, “It’s difficult to imagine more ardent advocates for this sleeping beauty of a piece”. In the current season, Henning gives the first ever performances of the work in Poland with the Poznan Philharmonic and in Finland with the Kymi Sinfonietta. Henning regularly performs on both violin and viola at major festivals and venues; recent collaborations have taken place at Wigmore Hall, King’s Place, Bruges Concertgebouw, Berlin Konzerthaus and Budapest’s kamara.hu festival, with artists such as Steven Isserlis, Joshua Bell, Lawrence Power, Leif Ove Andsnes, Håvard Gimse, Kathryn Stott, Natalie Clein, Christian Ihle Hadland, Christian Poltéra and Jeremy Menuhin. In the 18/19 season, Henning tours the UK with Adrian Brendel and Imogen Cooper, including a return to Wigmore Hall. In 2015, Henning became International Chair in Violin at the Royal Northern College of Music in Manchester, and in 2017 received a Fellowship. Passionate about musical education, Henning is a Professor at the Barratt Due Institute of Music in Oslo, and in 2018 was a jury member at the Menuhin Competition in Geneva, where he also performed the opening concert with Orchestre de la Suisse Romande under Marin Alsop. This season, he is a jury member at the Leeds Piano Competition. Henning’s eclectic discography includes many recordings on the Naxos label. His Naxos recording of Mozart Concertos Nos. 3, 4 and 5 with the Norwegian Chamber orchestra included Henning’s own cadenzas, and was awarded an ECHO Klassik Award as well as chosen as Classic FM’s Album of the Week, NDR Kultur’s CD of the Week, Editor’s Choice in Classical Music Magazine, Recommended in The Strad, and featured on BBC Radio 3’s Record Review. On the Simax label, Henning’s most recent release is a collaboration with the Arctic Philharmonic Orchestra and world-famous author Erik Fosnes Hansen. Entitled Between the Seasons, the disc features Vivaldi’s The Four Seasonsinterspersed with Henning’s own compositions. Also for Simax, Henning has recorded the complete solo sonatas of Ysaÿe, on a disc which won the prestigious Spellemann CD award. On the ACT label, he released a disc entitled Last Springwhich explored improvisations on Norwegian folk music with jazz pianist Bugge Wesseltoft. This season, the two artists re-join for a performance at Jazz at Berlin Philharmonic. Born in Oslo in 1973, Henning studied with Camilla Wicks and Emanuel Hurwitz. He is a recipient of the Grieg Prize, the Ole Bull Prize and the Sibelius Prize.